I doubt that it’s a coincidence that this regal loaf is shaped like a crown and embedded with jewel-like bits of fruit. A slice of Panettone is usually toasted and buttered for breakfast or served with a bit of jam after Christmas dinner. This is a new twist on this tall, golden bread with raisins and bits of candied lemon and orange peel, ideally with bits of cherries and other colorful, candied fruit. Krissy, A.K.A. “THE NAPKIN LADY” (*See her Napkin Folding video below) came up with this wonderful idea for Panettone: Panettone French Toast. 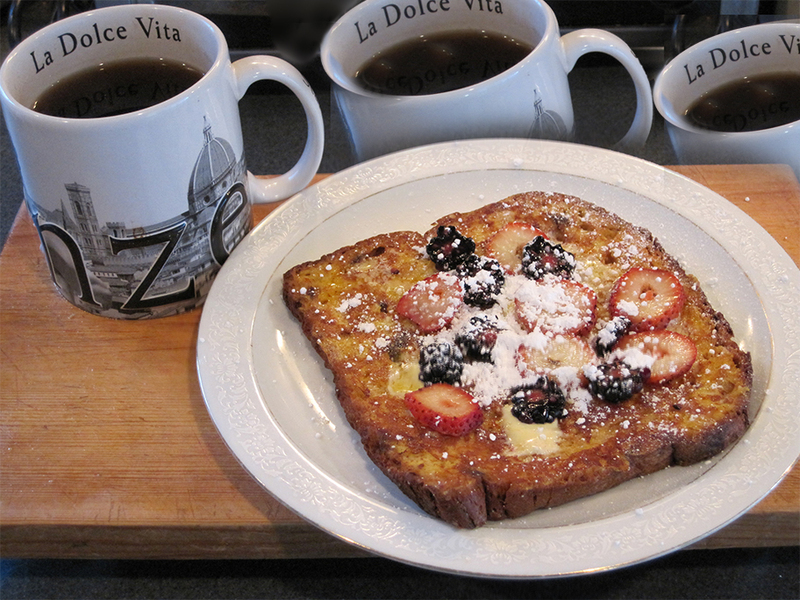 Simply prepare a **standard French Toast egg-mixture, saturate a slice of Panettone with the egg-mixture, then fry it in a bit of [olive] oil, top it with butter, sliced fruit (strawberries, blackberries etc.) and/or jam or jelly. Hit it with a sprinkling of powdered sugar and serve with Maple syrup (or Agave.) This is a delightful twist on an old favorite. [NEW] There was very little information about this before we did the post; If you do a search you will find all kinds of information about Panettone French Toast now. I’m not saying that Krissy was the first with this recipe, she was the first to tell me about it. **Since a slice of Panettone is usually much larger than a standard bread slice, add a tablespoon of orange juice to “stretch” the egg-mixture. I also add a shake or two of cinnamon. NEW 12/29/2018: to “stretch” the egg-mixture one can also add a tablespoon or so of Eggnog. *Watch Krissy the Napkin Lady’s video here.